The Southern Pacific Railroad was a major transportation force in Northern California and regions of Western Oregon from its construction beginning in the 1870s until the Company was mergered out of existence in 1996. Faced with many daunting challenges of geography and distance, the SP was always in the forefront of locomotive development and utilization. 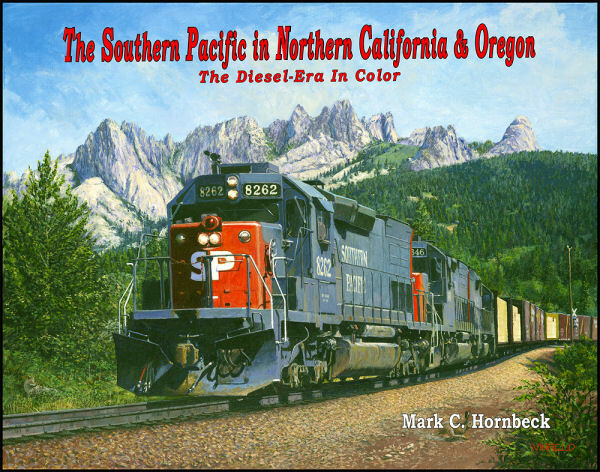 In this New Book, 'The Southern Pacific in Northern California & Oregon; The Diesel-Era in Color', observe the modern-day Southern Pacific Transportation Company between Portland, Oregon and Sacramento, California through the extraordinary photography of Mark C. Hornbeck as he travles the Golden Empire in search of contemporary railroading at its best. 300 never before published photographs in color, you'll see the diesel-era SP as you've never seen it before. Hard cover.